The Calanais (Callanish) Stones are situated on the western coast of the island of Leodhas (Lewis) in na h-Eileanan an Iar (the Western Isles or Outer Hebrides). Their remote location has probably helped with preventing their destruction in earlier times. There are three groups of stones (I, II and III) in the immediate vicinity, with a further seventeen (IV to VIII, VIIIa to XIX) labelled sites and numerous others with no Roman numeral suffix. Of these multitude of sites the first group is the most extensive, famous and important. It is estimated, as a result of excavation, that the stones were set in place between 2900 and 2600 BC - or nearly five thousand years ago. This means that they predate the main ring at Stonehenge, and are slightly older than the Great Pyramid at Giza, for example. This date places them in the Neolithic (New Stone Age) period. Calanais I is more complex than most surviving stone rings (which tend to be simply circular) as, looking down on it from above, it appears more like a Celtic Cross - i.e. a cross with a circle around the intersection point. It is not yet ascertained whether the cross and the circle were erected at the same time, or the cross added later. At the heart of the stones was a tomb, long since opened and emptied; but this tomb is thought to be a later addition, so was not the original reason for the stones. Bronze Age (which immediately followed the Neolithic) remnants found nearby, indicate that the site continued in use for centuries, but it was eventually abandoned, and between 1000BC and 500BC became enveloped in a peat mound, such that their significance was not apparent for most of the modern era. It was not until the peat was removed in 1857 that their importance and grandeur was appreciated. 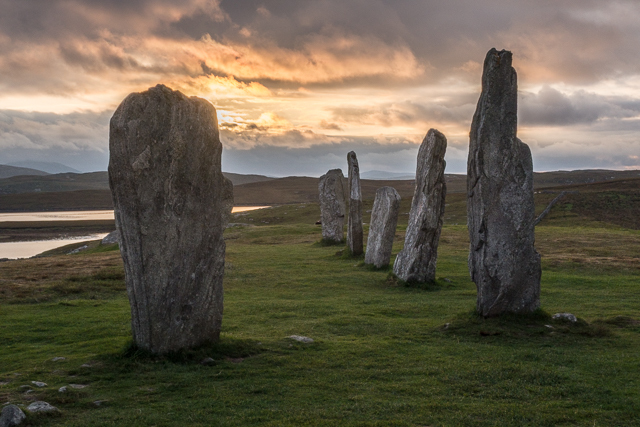 Calanais III is more extensive than CII having seventeen extant stones. These are arranged as two concentric ellipses. They are a short walk over marshy ground from CII and are the first group to be encountered when driving westwards to Callanish.